It all started in 1738 in the Swiss metropolis of La Chaux-de-Fonds, with the creation of a company whose celebrated techniques and traditions live on even today. Pierre Jaquet-Droz, a noted watchmaker of his time, was a master craftsman with an inimitable vision. 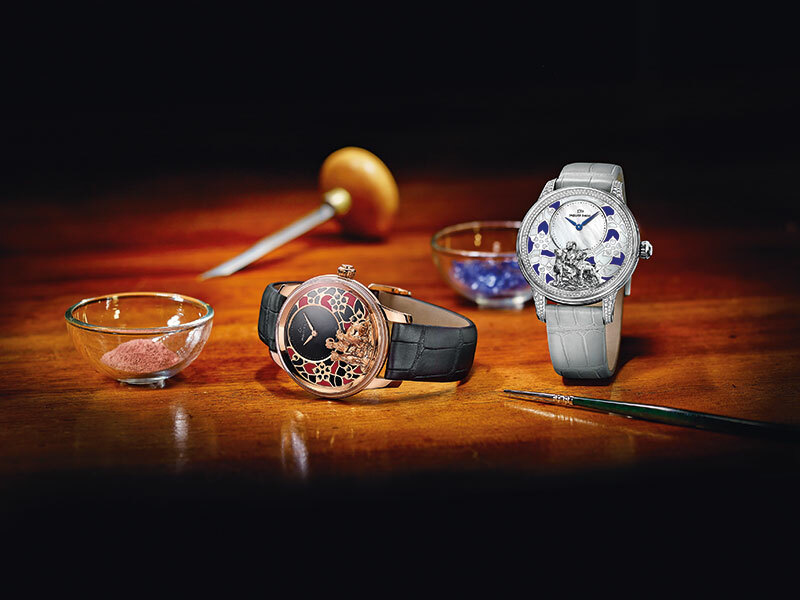 Under his guidance, the brand we all know as Jaquet Droz created horological art pieces that quickly became the darlings of European heads of state, as well as the Emperor of the Qing dynasty. Throughout the 18th century, the founding family broke new ground in luxury ornamentation, supporting generations of artists through their body of work. 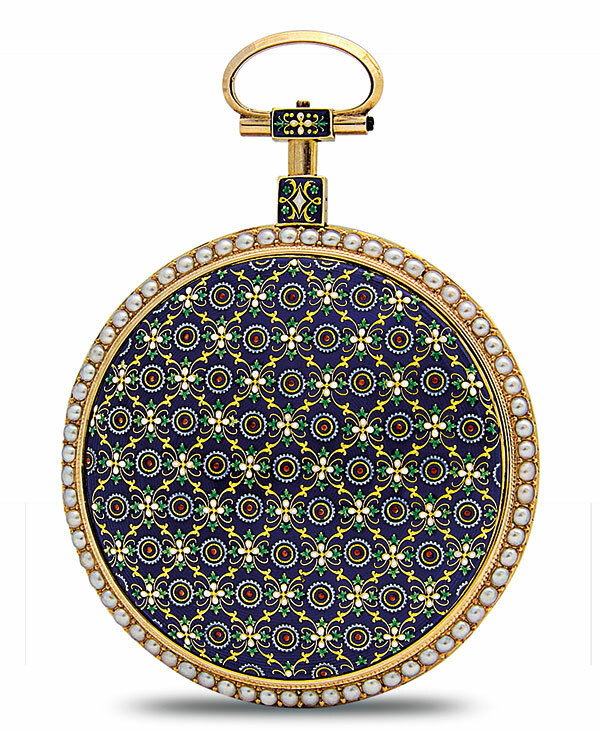 Enamelled cases adorned with sculpting, engraving, painting and paillons played an integral role in the watchmaker’s eminence. Anything that could be embellished — from urns and snuffboxes to pocket watches and mechanical birdcages — was decorated in the signature Jaquet Droz manner. The horological house has been linked with the fine arts from its very conception but what it truly specialises in is the ‘art of astonishment’. One of the earliest examples of this is the Jaquet Droz Legend — a sought-after collector’s item today — which lives on in the form of the ‘singing cages’ that the brand is so renowned for creating. A pair of birds, perched deftly within, play gentle melodies either on demand or are automated to spontaneously do so every hour. 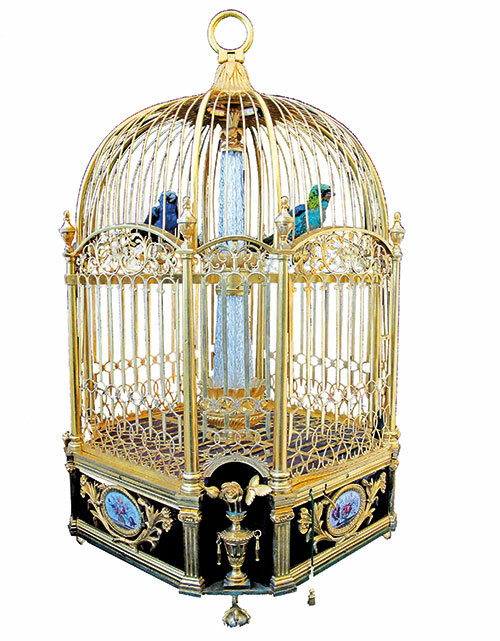 Birds are a much-loved feature, portrayed on paintings and dials within a vast family of collections; the most famous being the Bird Repeater — a minute repeater with eight diverse animation contrivances acting in sync. Earlier this year, a highly perfected version of The Charming Bird timepiece was revealed after years of development. 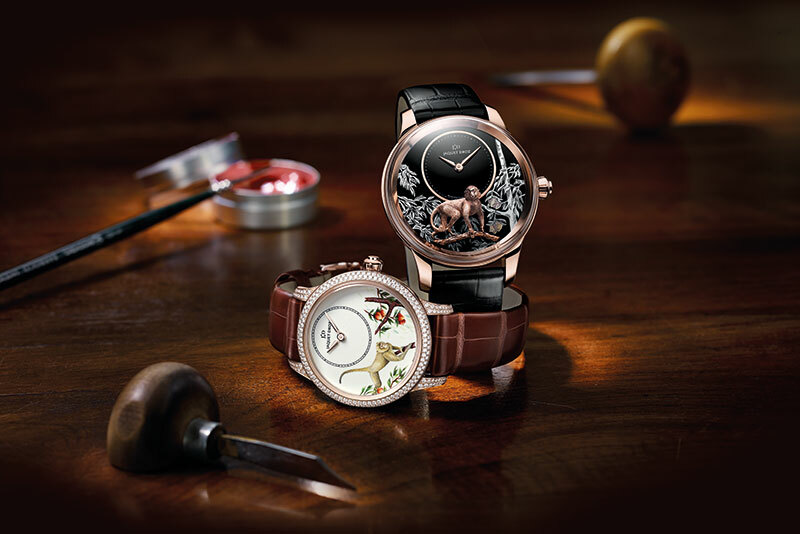 It features the exquisite handcrafted avian figurine — which sings, spins around and flaps its wings — against the backdrop of a stunning engraved mother-of-pearl dial that integrates the technique of paper cutting. 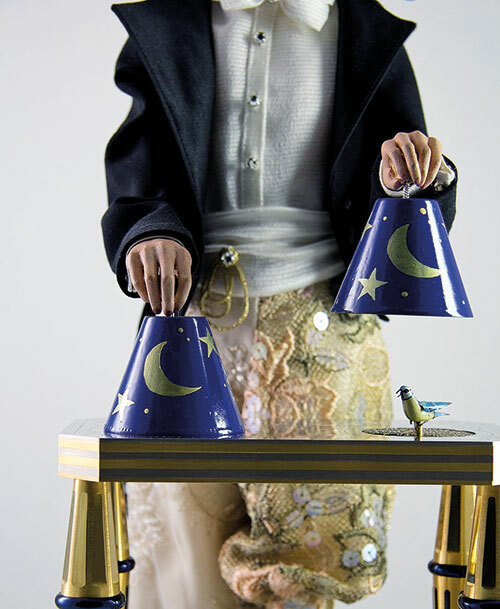 The brand’s mechanical expertise is underscored in its presentation of automata, which includes pieces like The Musician, The Writer and The Magician. Made using over 1,000 components, the last makes songbirds appear and reappear. What’s special about the watchmaker is that within its métiers d’art workshop, the craftsmen are focussed not only on the past, but also on the assimilation of modern technique and flair. They have been known to study and master several new skills over the course of time, including rare ones like a quail egg mosaic. Acquired by the Swatch Group in 2000, the brand continues to preserve the savoir-faire of its founder while simultaneously embracing innovation, through a number of practices that encompass its spirit. 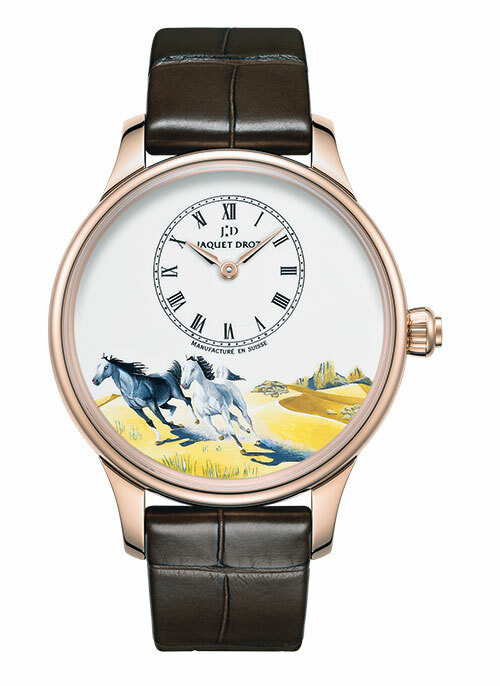 The clearest example of fine art applied to haute horology, the tradition of painting on enamel is one that the brand wishes to honour and uphold. This meticulous technique is applied to a few noteworthy pieces in its repertoire. Painted entirely by hand with the aid of a microscope, each one-of-a-kind piece takes at least a week to produce. Once they start to paint the dial, several coats must be applied in succession and put through the kiln, about 20 times in all. A final drying process fixes the paint, ensuring that it lasts for a long time. Making the most of a heritage of skills that have been preserved with exceptional care, motifs are either hand-engraved or moulded and then sculpted — creating the impression of relief. 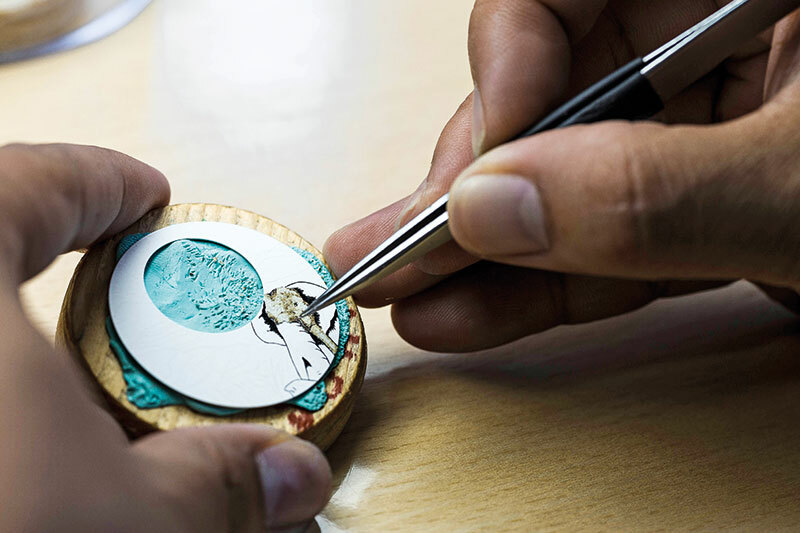 With the help of their chisels, gravers and rubbers, artisans achieve miniature appliques that feature on the dials of some of their ateliers d’art creations. This involves the setting of ornamental paillons (tiny motifs that are cut from gold or silver leaf) under a coat of translucent enamel. 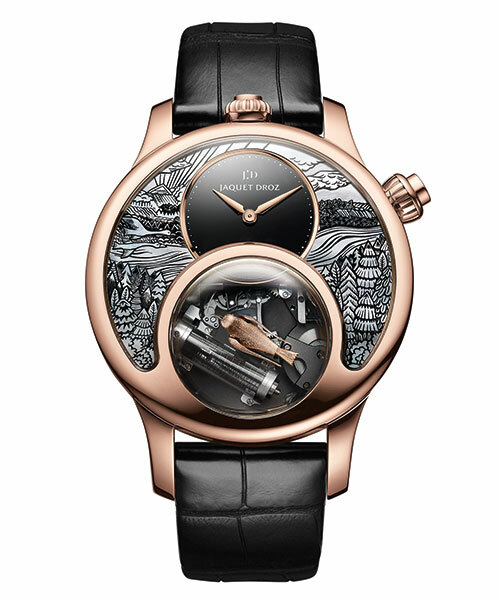 A technique central to Jaquet Droz’s traditional expertise, it requires flawless mastery in the use of extremely high temperatures. 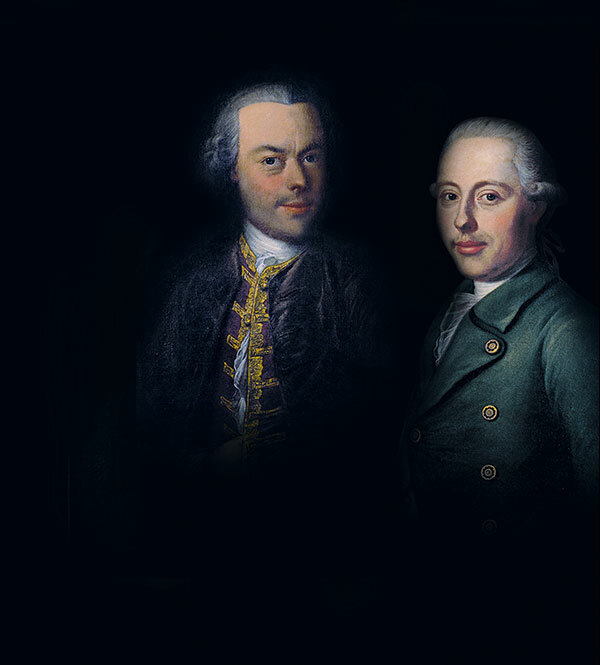 Pierre was a virtuoso of this practice which, thanks to him and a few others, was at its peak in the 18th century. When reviving the process, the brand initially used original paillons from that period, but now makes their own. A year ago, the brand was the first in watchmaking history to present a dial created using the ancient Asian art of eggshell mosaic. A limited-edition timepiece, Petite Heure Minute Elephant Mosaic features a vibrant representation of an elephant in a landscape of paddy fields, scrupulously realised with quail eggshell tesserae. The fragments of eggshell are sorted by colour, shape and purity until 2,000 usable ones are chosen and further hand-assembled one by one onto a red-gold dial. About 200 hours later, the scene is completed and then covered with a thin layer of clear lacquer. A distinctive moniker of the brand’s traditional timepieces, this method of decoration has been reinterpreted in contemporary collections. 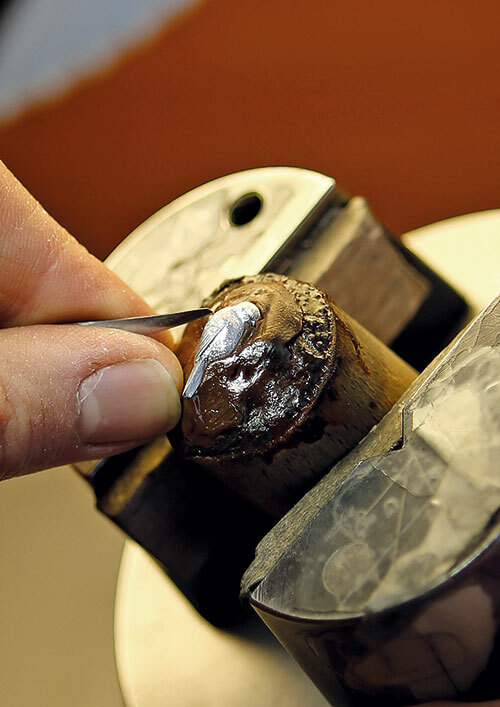 Here, the master artisan does not paint directly but instead applies layers of oxides onto the dial. It is then moved into a fire several times to allow motifs and colours to appear gradually. The term ‘grand feu’ directly translates to ‘grand fire’. Once the finished product has been accomplished, it is unalterable. The enamel will retain its lustre for generations to come, indefinitely enduring the effects of time. In the early days, mineral-faced watches were all the rage, therefore the watchmaker went ahead and perfected their creation of such pieces. The benefit of using minerals for the dials is the assurance that no two models will ever be alike. What’s more, the play of light, hue and complexity lend an elegant exclusivity. 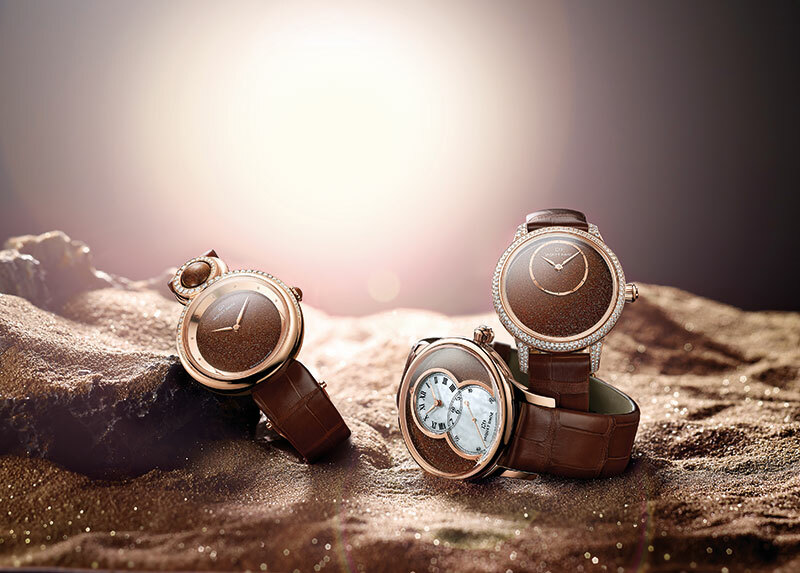 Jaquet Droz has carefully chosen materials like bronzite, lapis lazuli, meteorite, imperial jasper, mother-of-pearl, aventurine, spectrolite, ruby heart and onyx, all presented in their raw state; each possessing unique properties.